My daughters and I have created a process of inlaying cut stones into exquisite mosaic works of art. We have spent over ten years perfecting this process. Notice the quality of workmanship, the rich colors created by the stones, and how the colors and texture of the stones work together to enhance these pieces of art. Our mosaic tables also have this same quality and workmanship. The process we use is to first select the picture that we wish to immortalize and then select the stones. 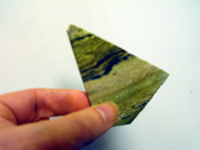 We look for stones with color, patterns, and light refraction to fit the pictures specific design. 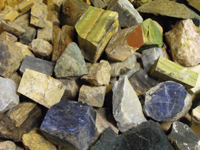 Next the rocks are cut into thin slices using the aid of a diamond saw and then integrately laid in place, such that the colors and paterens inhance the image. Once we have laid out all the stones, we cover the backside in fiber glass cloth and epoxy. After it hardens we grind out any imperfections and then cover the front side with a clear plastic finish. After all of the work has been completed, it is now ready to be framed or put into a tabletop.